It can be a bit startling when a compressor PRV valve opens.All of a sudden a ‘thing’ on the side of the compressor starts venting compressed air. Well that ‘thing’ is often the PRV and this page explains why. The PRV is, of course, the pressure relief valve, and if it opens during compressor operation, that usually points to a compressor problem developing whether with the compressor or the PRV itself, either remains to be seen. For folks that are not quite sure about what a PRV is and does here’s info about compressor PRV’s on this site. It is one thing when your compressor runs, will not stop, and will not build compressed air pressure. It’s an entirely different matter when the compressor runs, and runs, does not stop, is building compressed air pressure all the while, and eventually pops the pressure relief valve to vent too-high pressure. This is a dangerous situation and needs to be remedied immediately. If the compressor PRV valve opens at a pressure level below the normal cut out of the compressor, that suggests that it is the PRV valve itself that is the problem. If the air in the tank has excessive oil or water in it, some of that may migrate to the PRV. If that happens, that oil and water may ‘lubricate’ the PRV internals to the point where building pressure overcomes the force keeping the PRV closed, the PRV opens, and it starts to vent air before the compressor tank pressure reaches normal stopping levels. A good cleaning Of the PRV may resolve this. Power down the compressor, vent all of the air from the tank, remove the PRV, rinse in hot water with detergent, or even better, a clear solvent. Let dry thoroughly after the cleaning. Install it. If that works, and the PRV doesn’t blow off before the tank pressure reaches normal cut off, you may have resolved the issue. 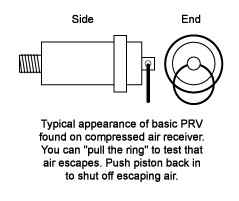 Do manually cycle the PRV several times after you’ve reinstalled it to make sure that the piston inside moves freely. But then, you probably want to bypass the pressure switch and let power get to the compressor motor and the compressor run until the pressure in the tank reaches the 15-20 PSI pressure level over the normal compressor stopping point that is the typical cracking point of a PRV. If the PRV does not crack at a max of 20 PSI over the normal pressure cut out, power down, vent the air, and replace the PRV with a new one that has the same cracking point. Or, if you want to make it simple, rather than bothering with cleaning and testing, simply acquire a new one. After you install it, cycle it a few times manually by pulling on the ring and pushing the piston back in to make sure it cycles. If the compressor PRV valve opens and the pressure level in the tank is higher than the normal cut out pressure level of the air compressor, that points to the pressure switch being the problem. The pressure switch is supposed to cut power to the compressor motor when the pressure in the tank reaches the switch cut out set point. If the motor continues to run past that pressure point, that must mean that the compressor pressure switch has failed in some manner. It may be fused points if your pressure switch has those, it may be a failed diaphragm, or the innards in the small, in-line pressure switch found on small compressors have shorted. At this point, it’s just a guess. The first step if this is the case is to replace the pressure switch. Many makes and models are available for sale on line, and there is a page on this site that explains fully the steps necessary to acquire a new switch. Still don’t know why your compressor PRV opens? If you have a PRV problem you can post a question at the end of this page. As you scroll down the page and you see all the questions and answers already posted about this subject, I suspect that you will find that someone else has already written in about what you are experiencing and the answer is already here. If your PRV problem is not noted already please post it below. And, if you’ve got a suggestion about solving the “compressor PRV valve blows” problem for someone else, either comment on their post, or start your own thread by using the form. Compressor PRV Valve Opens question? If so, do add it here, and please upload some photos focusing on the problem area?